Stingray is a British children's science-fiction television series created by Gerry and Sylvia Anderson and produced by AP Films (APF) for ITC Entertainment. Filmed in 1963 using a combination of electronic marionette puppetry and scale model special effects, it was APF's sixth puppet series and the third to be produced under the banner of "Supermarionation". It debuted on British television in October 1964. Set in the 2060s, the series follows the exploits of the World Aquanaut Security Patrol (WASP), a military organisation responsible for policing the Earth's oceans. The WASP's top vessel is Stingray, a combat submarine piloted by the daring Captain Troy Tempest, aided by his loyal navigator, Lieutenant "Phones", and Marina, a young woman from under the sea. Stingray's adventures bring it into contact with various underwater civilisations, some friendly and others hostile, as well as mysterious natural phenomena. In preparation for the series, APF acquired new, larger studios that it would continue to occupy for the remainder of the 1960s. Filmed at a cost of approximately £1 million, Stingray was the first British TV series to be made entirely in colour, a move intended to increase its appeal to the lucrative American market. The underwater sequences were filmed "dry" by shooting the sets through thin aquaria, while surface shots were filmed on water tanks incorporating lowered back walls to create artificial horizons. Stingray was the first Supermarionation series whose puppet characters were provided with interchangeable heads enabling them to show a variety of facial expressions. Stingray's 39 half-hour episodes were originally broadcast on Associated Television in the United Kingdom and in syndication in North America. The series has drawn a largely positive response from commentators, some of whom have compared its premise to the Cold War. Stingray, a nuclear-powered combat submarine, is the flagship of the World Aquanaut Security Patrol (WASP), a branch of the World Security Patrol (WSP) responsible for policing the Earth's oceans in the mid-2060s. [Note 1] Armed with "sting missile" torpedoes, it can travel at up to 600 knots (1,100 km/h; 690 mph) underwater and reach depths of over 36,000 feet (11 km; 6.8 mi). The WASP is based in the self-contained city of Marineville, located several miles inland somewhere on the West Coast of North America. It is connected to the Pacific Ocean via a tunnel leading to an "ocean door", through which Stingray is launched. General quarters alerts are sounded by rapid drum beats played over the base's public address system. In emergency situations, the entire base is lowered into vast underground bunkers on giant hydraulic jacks while fighter aircraft and interceptor missiles are launched to counter threats. WASP personnel acknowledge commands with the phrase "P.W.O.R." – short for "Proceeding With Orders Received". Stingray is piloted by the square-jawed Captain Troy Tempest. He is paired with Southern navigator Lieutenant George Lee Sheridan, nicknamed "Phones" for his side role as Stingray's hydrophone operator. Troy and Phones board Stingray by sitting on twin seats in Marineville's stand-by lounge, which are lowered into the submarine via injector tubes and then clamped into place. They answer to the crusty "hoverchair"-bound Commander Sam Shore, whose daughter, Lieutenant Atlanta Shore, works in the Marineville control tower and is enamoured of Troy. The series begins with the WASP's discovery that the ocean floor is home to many advanced civilisations. Prominent among these is the undersea city of Titanica, ruled by King Titan. A despot, Titan commands the Aquaphibians, a brutal warrior race, and possesses a fleet of lethal submersibles called "Mechanical Fish". [Note 2] In the first episode, Stingray is attacked by Titan's forces and Troy and Phones are captured. They are rescued by Titan's slave, Marina, a mute young woman from the undersea city of Pacifica who can breathe underwater. Troy and Phones take Marina to Marineville, where she becomes a permanent member of the Stingray crew. Troy becomes infatuated with her, making Atlanta jealous. Meanwhile, Titan, furious at Marina's betrayal, vows revenge on "terraineans" (land people) in general and Troy and the WASP in particular. Many later episodes revolve around Titan's unsuccessful schemes to destroy Stingray and Marineville, which usually fail due to the incompetence of Surface Agent X-2-Zero, his spy on land. X-2-Zero is based on the Pacific island of Lemoy, where he lives in an outwardly dilapidated house whose walls conceal banks of highly sophisticated surveillance and tracking equipment. Other episodes feature encounters with other races living under the sea or within the Earth (some friendly and others hostile), as well as investigation of natural phenomena. The final episode is a clip show in which Troy is named "Aquanaut of the Year" and a selection of Stingray's adventures are recalled as flashbacks. When a World Navy submarine is mysteriously destroyed, Troy and Phones are assigned to investigate. However, they are captured by the Aquaphibians and sentenced to life imprisonment in the undersea penal complex of Aquatraz by Titan of Titanica. A series of unsuccessful missile attacks against Marineville leads to the Stingray crew needing to sabotage the culprits' attempt to evade WASP's interceptor rockets. Commander Shore and Phones are held hostage by a plundering villain. Troy tries to find a way to rescue to his friends even it means disobeying Commander Shore's orders. The Stingray crew brave the perils of a newly discovered underground sea when their vacation leave is cancelled. Troy, Phones and Atlanta are sent to Scotland to solve the mystery of Nessie once and for all. A storm injures an admiral on his sailing vessel, causing him to lose his memory and turn his cannons on Stingray. Agent X-2-Zero sabotages a Navy Captain's test missile by loading it with real explosives. With the officer facing a court-martial at the hands of Commander Shore, it is up to Troy to prove the man's innocence. Agent X-2-Zero plots to damage Phones's reliability by creating false underwater soundings. Troy's dwindling air supply causes him to fall unconscious while on a rescue mission. Delirious, he dreams about life in a fantasy world where his friends are his loyal servants. Agent X-2-Zero kidnaps a pop star visiting Marineville and brings him before Titan as hostage. Troy and Phones encounter an old enemy when they try to find the submerged temple of Tajmanon in Africa. While Troy decides to help the orphaned son of a dead WASP aquanaut at Christmas, Phones is captured by an enemy warrior and forced to lay a trap for his comrade. Agent X-2-Zero makes plans to ruin a jazz group's performance in Marina's father's home undersea city with a bomb. Commander Shore relives the ordeal that left him paralysed when construction on a new cobalt mining rig is completed. Troy must be lowered onto Stingray from the air after Agent X-2-Zero plants a bomb on the craft's hull while a lieutenant uses it for target practice. Troy and Phones investigate after a signal from a disused lighthouse confuses a pilot and causes him to crash his aircraft. After Stingray destroys two attacking submarines, Troy, Phones and Marina stumble across their source – the underwater city of Solarstar. They aim to foil the Solistans before they can obliterate the West Coast of America. While asleep, Troy dreams of a meeting between him and a group of undersea cavemen who have looted the cargo of a vessel ferrying radioactive material. Venturing into the base of a volcano to investigate the disappearance of a robotic probe, Troy and Phones are captured by two survivors from a ruined city. An Eastern dictator called El Hudat wishes to join the World Aquanaut Security Patrol but kidnaps Marina after he is overthrown in his home country. Troy and Phones save an unconscious man, unaware that he is trying to leave Marineville open to attack by subduing personnel with a self-induced hypnotic trance. Troy falls asleep in the Standby Room and dreams about shrinking in size and witnessing a meeting between the undersea races in which they finalise their plans to destroy Marineville. Agent X-2-Zero frees the wicked former dictator El Hudat from the Marineville brig by replacing him with his twin brother. When Stingray becomes trapped in a whirlpool, the crew must face off against undersea pirates. Agent X-2-Zero poses as a film director in his latest scheme to eliminate Troy. Stingray becomes ensnared in a patch of pink slush created by an unidentified vessel. Three disused freighters that are due to self-destruct disappear in mysterious circumstances. Troy is assigned to recover a beautiful pearl from the seabed, but the task is not as straightforward as it seems. The Stingray crew is captured by undersea villains and interrogated for information on Marineville's defence systems. An eccentric professor is brought in to develop a super missile which is Marineville's only hope of destroying an indestructible undersea craft. An insane professor kidnaps Atlanta and steals Stingray with the intention of destroying Marineville. Agent X-2-Zero masquerades as a teacher for mute people in a plot to destroy Marineville, leaving Marina in mortal danger. While probing the destruction of an oil rig with Troy and Phones, Atlanta is captured by undersea warriors. Outraged that his slave Marina assisted Troy and Phones in their escape from Aquatraz, Titan plots his revenge by ordering Agent X-2-Zero to deliver a toxic plant to her father. Troy is poisoned by Aquaphibians and the sole owner of the required antidote is Titan, who demands Marina in exchange for saving Troy's life. Titan hears of the work of scientists converting sea minerals to gold and plans to sabotage their efforts. An aquatic alien kidnaps a World Navy admiral and his wife. All the signs point to Commander Shore after an essential component vanishes from Marineville Control. Clip show episode: Troy is amazed to receive the prestigious "Aquanaut of the Year" award and sits before a TV audience as a selection of his adventures are recounted as flashbacks. Includes clips from "Emergency Marineville", "Raptures of the Deep" and "Subterranean Sea". The main characters, joined by Admiral Denver, review some of Stingray's most dangerous missions. A 99-minute feature presentation, created for Japanese TV executives in 1963, comprising four complete episodes: "Stingray", "An Echo of Danger", "Raptures of the Deep" and "Emergency Marineville". A 29-minute condensed reconstruction of the 1963 feature presentation, excluding the material from "Raptures of the Deep". Created in collaboration with BBC Wales. First broadcast as part of "Gerry Anderson Night" on BBC Four on 2 January 2008. Between 1980 and 1981, two compilation films were produced, each made up of re-edited versions of four of the original episodes. These films were produced specifically for the American market and aired in the United States as part of an ITC Entertainment package titled "Super Space Theater"; other Supermarionation series were given similar treatments. One of the Stingray films, Invaders from the Deep, was broadcast as the first episode of movie-mocking TV series Mystery Science Theater 3000 in November 1988. Captain Troy Tempest: pilot of the WASP's main submarine, Stingray. "Phones": a WASP lieutenant, Stingray's navigator and hydrophone operator, and Troy's best friend. His real name, George Lee Sheridan, is mentioned in the series' publicity material but not spoken on-screen. Marina: a young woman from under the sea who joins the Stingray crew. She is the former slave of King Titan of Titanica. Daughter of Aphony, ruler of the undersea city of Pacifica, she is mute like all other Pacificans. Lieutenant Atlanta Shore: assistant controller in Marineville Tower and rival of Marina for Troy's affections. Commander Samuel Shore: head of Marineville and father of Atlanta. He cannot walk and is confined to a hoverchair. The reason for his disability is revealed in the episode "The Ghost of the Sea": as a security agent for a deep-sea mining platform, he was seriously injured when a hostile submersible attacked the facility and damaged his patrol craft. Sub-Lieutenant John Horatio Fisher: an eager, young WASP lieutenant who is junior assistant controller in Marineville Tower. In the episode "Rescue from the Skies" he is seen training to be an aquanaut. King Titan of Titanica: the tyrannical ruler of the undersea city of Titanica and Marina's former master. Surface Agent X-2-Zero: Titan's main agent on land. Aquaphibians: an undersea warrior race who serve as Titan's minions. Oink: a seal pup who joins the Stingray crew as Marina's pet after saving them from a bomb in the episode "Sea of Oil". Admiral Jack Denver: the president of the WASP underwater research division. He went to college with Commander Shore and enjoys debating with him. WSP Commanders: three World Security Patrol commanders, based at WSP Headquarters in Washington, D.C., who appear in various episodes to brief Commander Shore. In late 1962, as production on Fireball XL5 drew to a close, Gerry Anderson decided that an underwater series was the next logical step for production company AP Films (APF): "We had been on land and in space, so where could we go next? One possibility was underwater." He was inspired by childhood memories of U-boats in the Second World War, as well as by the mysteries of the ocean: "I was ... fascinated by trenches in the ocean that are as deep as mountains are high. There are features that man has never seen and pressures that are almost impossible to withstand. I began to wonder if there were areas of the Earth which had been little explored and felt justified in writing some wacky stuff." APF's financer Lew Grade, who had bought the company after the success of Fireball XL5, approved the concept and commissioned 26 episodes. Anderson named the new series "Stingray" partly from a belief that stingrays are dangerous animals (in reality, they are docile), but also because it "seemed an exciting title." In preparation for the new series, APF, then based on the Slough Trading Estate's Ipswich Road, moved to a larger site on the nearby Stirling Road at a cost of £75,000 (approximately £1.54 million in 2018). The new studios, built inside a converted factory unit, contained three 40-by-45-foot (12 m × 14 m) shooting stages: two for puppet filming and one for special effects. This arrangement allowed two episodes to be filmed simultaneously by separate crews. Production began in spring or June 1963 and the series was completed in ten months. Each episode required an average of 11 days' puppet filming and 5.5 days effects shooting. The total cost of the production was approximately £1 million (approximately £20.57 million in 2018). The budget per episode was £20,000 (approximately £0.41 million in 2018), which enabled APF, whose earlier productions had been in black and white, to film in Eastmancolor. [Note 5] Though Stingray was to premiere in black and white in its country of origin, the switch to colour filming was intended to increase the series' chances of being bought by a network in the US, where colour TV broadcasts were already common. Sets were re-painted after NBC supplied APF with a list of colours believed to cause problems such as flaring or bleeding; according to Anderson, this was unnecessary because when filmed in Eastmancolour, a set "would appear on screen exactly as you had painted it." Some colours were avoided as they did not come out well in black and white, and models and sets were painted differently to ensure that they did not blend into each other. During the production of Stingray, APF became the UK's largest colour film consumer. Grade later extended his commission to 39 episodes. As shooting on the final 13 episodes commenced, voice actors Don Mason and Robert Easton, who had understood that all members of the cast were on equal pay, learnt that they were actually earning less than their co-star David Graham. They did not commit to the remaining episodes until their fees had been re-negotiated. In a first for a Supermarionation series, Stingray features a Christmas-themed episode ("A Christmas to Remember") and a clip show series finale, "Aquanaut of the Year". The latter incorporates elements from This Is Your Life, for which APF was required to obtain the approval of the programme's creator, Ralph Edwards. The negotiations with Edwards were slow to progress, so work commenced on an alternative finale in which the characters of Commander Shore and Admiral Denver use a film projector to view recordings of some of Stingray's past missions. However, production on this episode was halted when Edwards finally gave APF permission to proceed with "Aquanaut of the Year". The linking material from the abandoned episode was re-discovered in 2000 or 2001 and subsequently included on Stingray DVD releases. Several years later, it was combined with footage from "Stingray", "An Echo of Danger", and "Emergency Marineville" to create a new 29-minute clip show titled "The Reunion Party", which was first broadcast in 2008. Sylvia Anderson, who had voiced the regular characters of Jimmy Gibson in Supercar and Dr Venus in Fireball XL5, wrote in her 2007 autobiography that she devised Marina as mute because she wanted to take a break from voice acting and "concentrate on the scripts and characters". Her vocal contributions to Stingray were limited to uncredited guest roles in the episodes "Raptures of the Deep" (as Marina)[Note 4] and "A Christmas to Remember". Gerry Anderson said that the character of Phones was inspired by the mannerisms of a sound engineer with whom he had once worked: "He spent so long with his headphones plugged in to various bits of equipment that he used to leave them on all the time, earning himself the nickname 'Phones'." Voice actor Robert Easton based the character's Southern American tones on his performance in the 1961 film Voyage to the Bottom of the Sea, in which he had played a Southern radio operator called Sparks. The voice of Surface Agent X-2-Zero was Easton's impression of actor Peter Lorre, who had appeared in the same film. The look of the Aquaphibians was based on that of a villainous alien that had appeared in the Fireball XL5 episode "XL5 to H2O". The Aquaphibian voices were supplied by Robert Easton and David Graham supplemented by a looped tape recording of bubbling water. The process of designing and making the puppets took four months and each of the main characters was sculpted in duplicate to allow episodes to be filmed in pairs simultaneously. The likenesses of some of the puppets were inspired by real-life actors: at Gerry Anderson's suggestion, Troy Tempest was modelled on James Garner, while Titan was based on a young Laurence Olivier and Surface Agent X-2-Zero on either Claude Rains or Peter Lorre. Atlanta Shore has been likened to Lois Maxwell (who voiced the character) and Marina to both Brigitte Bardot and Ursula Andress. Stingray was the first Supermarionation series to feature puppets with glass eyes and poseable hands for greater realism. To make the puppets' eyes sparkle in a life-like way, they were polished with silicon and illuminated using an "eye light" (a small lamp). Another innovation was the creation of alternative heads to allow puppets to display emotions: in addition to their "normal" heads, which had neutral expressions, the main characters could also be fitted with "smiling" and "frowning" heads. The wigs of female puppets were made of human hair; for male puppets, mohair was used as it was softer and easier to style. The Stingray submarine was designed by Reg Hill and built by Feltham-based company Mastermodels. The Marineville model, which was created in-house, was made of wood and cardboard augmented with pieces of model kits purchased from a toy shop. It was lowered and raised by hydraulics. Most of the series' special effects shots were filmed on high-speed cameras with the footage slowed down in post-production to give a greater sense of weight and scale. The series' underwater scenes were filmed not in a water tank, as Anderson had originally envisaged, but by shooting a model of the ocean floor, mounted against a cyclorama, through a thin aquarium and "flying" the puppets and miniature models across the set on wires from an overhead gantry. A similar technique had been used for the underwater scenes in Supercar. Several aquaria were used; constructed by a company that supplied fish tanks to London Zoo, they were re-built with thicker glass after one of them burst due to the water pressure. Wires were painted over to make them non-reflective, while vegetable dye was added to the aquaria to give the water a murky appearance. Fans were used to simulate currents passing over characters' hair and clothing. The illusion of scenes being set underwater was enhanced by populating the aquaria with tropical fish of various sizes to create forced perspective. Fish food was dropped at various points around the aquaria to keep the animals in shot. A disc with various portions cut out was mounted in front of a lamp and rotated to simulate light being refracted through the ocean surface, while the water inside the aquaria was disturbed to create "ripple" effects. For the climax of the Stingray launch sequence, in which the submarine shoots out of an underwater tunnel, part of the set was painted onto the aquarium to conceal the air line that was used to produce the accompanying bubbles. The move away from black-and-white filming was sometimes problematic as build-ups of algae in the aquaria caused the water to change colour. For surface-based scale model shots, a major problem facing the effects team was the need to maintain a realistic look while working on water, which cannot be miniaturised. Surface water shots in Supercar and Fireball XL5 had been filmed in a single outdoor water tank, but for Stingray a number of tanks were built inside the studio. The crew were unable to make the water look blue through lighting effects, so it was instead dyed to give it a realistic colour. Various powders were added to create whitewater and foam effects for undersea explosions and storm scenes. Miniature models were controlled using wires, poles and underwater tracks and rigs. Each tank incorporated a weir system whereby one or more walls, including the back wall, were built lower and the tank was filled to a higher level to produce waterfalls. With the camera mounted at water level, this created an artificial horizon at the back of the tank. To sustain the effect, the overflowing water was collected in troughs and then pumped back into the tank, thus keeping the water level constant. To conserve studio space, some scenes were filmed in a wedge-shaped tank built to match the field of view of the camera. One of the effects shots in the opening titles – a complex manoeuvre in which Stingray and a pursuing Mechanical Fish leap out of the sea – was filmed in a single take. Shots of aircraft in flight were filmed using a technique known as the "rolling sky", whereby the miniature model remained stationary and an illusion of movement was created by running a painted canvas background in a loop around two electrically-driven rollers. This system, devised by effects director Derek Meddings, made aerial shots easier to film as it took up little studio space. The title sequence consists of a series of action shots featuring undersea explosions, Marineville going to red alert and Stingray being launched to do battle with a Mechanical Fish. This is accompanied by dramatic narration from the character of Commander Shore, who warns the audience to "Stand by for action!" before declaring that "Anything can happen in the next half-hour!" In the first 26 episodes, the title sequence opens in black and white before switching to colour; for the final 13 episodes, the first few seconds were replaced with all-colour footage. Jim Sangster and Paul Condon, authors of Collins Telly Guide, praise this introduction, writing that "Of all the programmes we've looked at for this book, there is none with a title sequence as thrilling as Stingray." Anthony Clark of the British Film Institute calls the sequence "a mini-adventure in itself ... Children's TV had never before been this exciting." 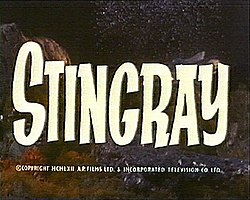 According to John Peel, the Stingray title sequence contrasts greatly with those of Supercar and Fireball XL5, which he describes as "straight narrative openings". Peel also argues that Stingray has influenced the "rapid cutting, pounding rhythms and extreme stylising" of later TV title sequences. The series' closing titles focus on the love triangle between Troy, Marina and Atlanta. They feature Troy singing "Aqua Marina" – a song about his romantic feelings for Marina, performed by Gary Miller with soprano backing vocals – while Atlanta gazes wistfully at his photograph. In the UK, Stingray was first broadcast on 4 October 1964 in the Anglia, Border, Grampian, London and Southern regions. It premiered in the Channel, Midlands and Westward regions on 6 October, and on Granada Television on 30 December. Having debuted in black and white, it was broadcast in colour for the first time in December 1969. The series received little publicity but replicated the success of earlier Supermarionation productions. It was repeated on ITV in 1981 and on BBC2 in the early 1990s. In the US, the series was first broadcast in 1965. Premiering in colour, it was syndicated across more than 100 markets with total sales exceeding £3 million. It aired on the Sci-Fi Channel in 1994. Stingray was featured in the Supermarionation tie-in comic TV Century 21 from its first issue, published by AP Films (Merchandising) in January 1965. The 1960s also saw the publication of two original novels by Armada Books: Stingray and Stingray and the Monster, written by John William Jennison under the pseudonym "John Theydon". To supplement the TV episodes, in 1965 AP Films (Merchandising) released three "audio adventures" as 7-inch vinyl EP records (marketed as "mini-albums"). These audio plays, each approximately 21 minutes long and featuring the voice cast from the TV series, are included as special features on the UK Stingray DVD box set. "Into Action With Troy Tempest"
While investigating the disappearance of a submarine, the crew of Stingray find themselves trapped in a subterranean sea that later becomes a desert. This audio episode combines the plots of the TV episodes "Stingray", "Deep Heat" and "Subterranean Sea". Troy gives a young boy a tour of Marineville. Writing in 2006, Robert Sellers described Stingray as the "first truly classic Anderson show", whose special effects "have stood the test of time remarkably well." Daniel O'Brien, author of SF:UK: How British Science Fiction Changed the World, considers it to be "perhaps the archetypal Gerry Anderson series". Andrew Blair of the website Den of Geek describes Stingray as "the lesser of the Holy Triumvirate of Supermarionation (Thunderbirds, it, and Captain Scarlet). It's shorter than the former, and lighter than the latter, giving it a comparatively breezy feel ... Stingray is inherently a matinee adventure, an inspiring rush of mild peril and jaunty escapades." Ranking the Anderson productions, Morgan Jeffery of Digital Spy places Stingray fourth, calling it "a kids' adventure serial of the highest order". Peel, despite praising Stingray, believes that Fireball XL5 and Thunderbirds had more appeal. Comparing Stingray to APF's earlier work, media historian Marcus Hearn observes that the series essentially "[transfers] the format of Fireball XL5 to an underwater setting." Peel suggests that the choice of location was influenced by a 1960s vogue for sea exploration inspired by the work of adventurers such as Jacques Cousteau and Thor Heyerdahl. Clark notes that Stingray, like Fireball XL5, uses "some very simple elements – a four-square hero, a fantastic craft which lends its name to the show and a mix of fast-paced action and innocent humour." Commenting on the storytelling, Paul Mavis of the website DVD Talk writes that the series employs a "'heroes and villains' dynamic, hung on a well-worn melodramatic comic book framework (and gussied-up with sci-fi, Bondian trappings)". Blair describes the love triangle between Atlanta, Troy and Marina as an "unusual development" for a children's series, while Peel argues that Stingray saw the peak of the "tongue-in-cheek humour" favoured by Gerry Anderson. Mike Fillis of TV Zone magazine regards Stingray as less "ambitious" than Thunderbirds but compares its "self-awareness" and "looseness" favourably to the "po-faced rigidity" of Captain Scarlet. He also praises the series' "well-drawn" characters and describes its water-based special effects as "surprisingly elegant". Paul Cornell, Martin Day and Keith Topping, authors of The Guinness Book of Classic British TV, regard the effects as more "realistic" than those of earlier Anderson series. They also argue that while many episodes were "predictable and corny", the series had a "knowingness and a love of character that made the whole thing charming." Some criticism has been directed at the puppetry and effects. Mavis suggests that the series' use of aquaria makes the underwater scenes look "a tad creaky" but believes that they compare well to contemporary feature film effects. Glenn Erickson comments that as in other Supermarionation series, the puppets' lack of mobility makes their scenes "rather static". He also notes that due to this limitation, movement is often kept off-screen: "Almost every capture by Aquaphibians ellipses difficult-to-film interaction, skipping straight to static talking scenes instead." However, Mavis and Erickson both comment positively on the series overall. For Mavis, Stingray is "generally delightful, sometimes weird" and boasts "almost big-screen-worthy direction and editing". Erickson argues that the episodes not featuring Titan provide "welcome detours from the central aggression theme", and sums up Stingray as a "silly but captivating kiddie show". For Jon E. Lewis and Penny Stempel, authors of Cult TV: The Essential Critical Guide, the series featured "plenty of kiddie-time exciting narrative action, while the more sophisticated could enjoy its proclivity to spoof virtually everything which passed its periscope." Sangster and Condon argue that while Stingray was primarily a children's series, it was also the first Anderson production with adult appeal. Comparing Stingray to Thunderbirds, they describe the former's episodes as "mercifully shorter, leading to tighter plotting and an engaging simplicity". Praise has been directed at the music. Erickson describes it as "corny retro" and appropriate to the series' tone, while Clark calls it the "best underwater adventure music ever written". Media historian Nicholas J. Cull comments that through its depiction of the World Aquanaut Security Patrol (WASP), Stingray is one of several Gerry Anderson series to "assume the development of world government and world security institutions" and "reflect the 1960s vogue for stories set in secret organisations with extravagant acronyms." He compares the premise of the series to the Cold War, noting the conflict between WASP and the undersea races and the latter's use of spies to infiltrate human society. Cull names "Marineville Traitor", which focuses on a hunt for an "enemy within", as one episode with an "especially strong Cold War flavour". He also notes that while Anderson's productions often depict nuclear technology as a hazard, Stingray also portrays it in a positive light: the Stingray submarine itself, for example, is nuclear-powered. Sarah Kurchak of The A.V. Club argues that Titan and the Aquaphibians represent a "more classically Cold War-style villainous Other" compared to villains of earlier Supermarionation series. She adds that in Stingray, "the battle lines between land and sea are clearly defined, the enemy is always watching, and the target of their aggression is always close to home." Kurchak also suggests that through his "multiple nightmares" about threats to Marineville, the character of Troy Tempest serves to embody Cold War anxieties. O'Brien writes that Stingray contains "more than a touch of the Cold War ethos", arguing that Titan "could have easily belonged to an underwater branch of the Soviet Bloc." In the film Aquaman (2018), Stingray is briefly seen playing on character Tom Curry's television set. ^ Sources give the year as 2064 (Archer and Hearn, p. 88; Bentley 2001, p. 12) or 2065 (Sellers, p. 88). The episode "The Lighthouse Dwellers" is set in 2065 (La Rivière, p. 103). The episode "Eastern Eclipse" is set 12 months after "Star of the East" (Bentley 2008, p. 92). ^ In tie-in media, they are called "Terror Fish" (Bentley 2008, p. 355). ^ The first episode has no on-screen title but is referred to as "Stingray" in documentation by distributor ITC Entertainment (Archer and Hearn, p. 97). It is also known as "Stingray (The Pilot)" or simply "The Pilot" (Rogers et al., p. 44). It was not devised as a true pilot as Lew Grade, the Andersons' financial backer, had already approved the series format (Fryer 2016, p. 82). In his biography, Gerry Anderson said that the first episodes of series that he produced were called "pilots" for the sake of convenience (Archer and Hearn, p. 88). ^ a b c Marina is voiced by Sylvia Anderson on two occasions: the TV episode "Raptures of the Deep" and the audio play "Marina Speaks" (Bentley 2008, p. 86). In "Raptures of the Deep", Troy experiences a hallucination in which Marina communicates with him telepathically. "Marina Speaks" reveals that Marina is actually not mute at all, but unwilling to speak due to a curse that Titan placed on her people – should any one of them speak, another will die (Sangster and Condon, p. 722). ^ The opening credits refer to the colour process as "Videcolor". ^ Evans, Jeff (2006) . The Penguin TV Companion. Penguin Reference (3rd ed.). London, UK: Penguin Books. p. 786. ISBN 978-0-141-02424-0. ^ a b c d e f g h i j k l m n o p q r s t Bentley 2008, p. 79. ^ a b c O'Brien, p. 80. ^ Bentley 2008, p. 80. ^ La Rivière, p. 96. ^ a b Rogers et al., p. 68. ^ a b c d e f g Sangster, Jim; Condon, Paul (2005). Collins Telly Guide. London, UK: HarperCollins. p. 722. ISBN 978-0-00-719099-7. ^ a b c La Rivière, Stephen (May 2013). Bradley, David, ed. "Time Machine: Stingray". SFX. No. 233. Bath, UK: Future Publishing. pp. 76–77. ISSN 1749-6969. OCLC 813632043. ^ a b Bentley 2008, pp. 81-93. ^ Fryer, Ian (2011). Script To Screen. FAB Issue 69. ^ a b c d Bentley 2008, p. 94. ^ "BBC Four – Schedules, Wednesday 2 January 2008". BBC Online. BBC. Archived from the original on 2 June 2018. Retrieved 24 March 2019. ^ Beaulieu, Trace; Chaplin, Paul; Mallon, Jim; Murphy, Kevin; Nelson, Michael J.; Pehl, Mary Jo (May 1996). The Mystery Science Theater 3000 Amazing Colossal Episode Guide. Bantam Books. p. 40. ISBN 978-0553377835. ^ Archer and Hearn, p. 88. ^ a b c d Archer and Hearn, p. 89. ^ Bentley 2001, pp. 11-12. ^ a b c d e f La Rivière, p. 102. ^ a b Archer and Hearn, p. 90. ^ Lewis, Richard (2002) . The Encyclopaedia of Cult Children's TV. London, UK: Allison & Busby. p. 286. ISBN 9780749005290. ^ a b c d e Archer and Hearn, p. 91. ^ Archer and Hearn, p. 99. ^ a b Archer and Hearn, p. 100. ^ May, Dominic (May 2001). "News: Stingray and Scarlet". TV Zone. No. 138. London, UK: Visual Imagination (published April 2001). p. 6. ISSN 0957-3844. OCLC 226121852. ^ Anderson, Sylvia (2007). Sylvia Anderson: My Fab Years!. Neshannock, Pennsylvania: Hermes Press. p. 21. ISBN 978-1-932563-91-7. ^ Bentley 2008, p. 86. ^ Bentley 2008, p. 93. ^ a b c d e La Rivière, p. 101. ^ Bentley 2008, p. 67. ^ a b c d e Archer and Hearn, p. 94. ^ a b c d La Rivière, p. 98. ^ Rogers et al., p. 75. ^ Hirsch, David; Hutchison, David (September 1978). Zimmerman, Howard, ed. "The Magical Techniques of Movie & TV SFX – Part XI: Supermarionation". Starlog. Vol. 3 no. 16. New York City, New York: O'Quinn Studios. pp. 58–66. ^ Rogers et al., p. 53. ^ Watson, Nigel (28 September 2015). "Stingray: The Complete Collection". starburstmagazine.com. Archived from the original on 30 May 2018. Retrieved 24 March 2019. ^ Hearn, Marcus (September 2015). "Setting the Scene". In Hearn, Marcus. Thunderbirds – A Complete Guide to the Classic Series. Tunbridge Wells, UK: Panini UK. p. 63. ISBN 978-1-84653-212-2. ^ a b c Archer and Hearn, p. 93. ^ La Rivière, p. 99. ^ a b c d e Archer and Hearn, p. 92. ^ Rogers et al., p. 83. ^ a b Meddings, p. 33. ^ a b Meddings, p. 32. ^ a b Meddings, p. 34. ^ La Rivière, p. 100. ^ a b Hearn, p. 38. ^ Rogers et al., p. 84. ^ Rogers et al., pp. 84-85. ^ La Rivière, p. 103. ^ a b Clark, Anthony. "Stingray (1964-65)". Screenonline. London, UK: British Film Institute. Archived from the original on 17 March 2018. Retrieved 23 February 2019. ^ a b Peel, p. 241. ^ Archer and Hearn, p. 98. ^ Bentley 2017, p. 188. ^ Archer and Hearn, p. 260. ^ Bentley 2017, p. 194. ^ Lewis and Stempel, p. 174. ^ Rogers et al., p. 94. ^ Bentley 2001, p. 12. ^ Muir, John Kenneth (2015) . Exploring Space: 1999: An Episode Guide and Complete History of the Mid-1970s Science Fiction Television Series. Jefferson, North Carolina: McFarland & Company. p. 5. ISBN 978-0-786455-27-0. ^ Bentley 2001, p. 108. ^ Bentley 2008, p. 367. ^ a b c d Bentley 2008, pp. 354-355. ^ Bentley 2008, p. 354. ^ a b O'Brien, p. 81. ^ a b Blair, Andrew (23 January 2013). "Celebrating Stingray". Den of Geek. London, UK: Dennis Publishing. Archived from the original on 27 November 2017. Retrieved 23 February 2019. ^ Jeffery, Morgan (14 April 2018). "Ranking all of Gerry Anderson's Classic TV shows, from Thunderbirds to Captain Scarlet". Digital Spy. London, UK: Hearst UK. Archived from the original on 3 June 2018. Retrieved 23 February 2019. ^ a b Peel, John (1986). The Gerry Anderson's Stingray Files. Los Angeles, California: Psi Fi Movie Press. p. 11. ^ a b c Mavis, Paul (13 January 2015). "Stingray: The Complete Series – 50th Anniversary Edition". DVD Talk. El Segundo, California: Internet Brands. Archived from the original on 11 September 2017. Retrieved 23 February 2019. ^ Fillis, Mike (May 2001). "Reviews: Merchandise: Stingray". TV Zone. No. 138. London, UK: Visual Imagination (published April 2001). p. 82. ISSN 0957-3844. OCLC 226121852. ^ Cornell, Paul; Day, Martin; Topping, Keith (1996) . Marshall, Anne, ed. The Guinness Book of Classic British TV (2nd ed.). London, UK: Guinness Publishing. p. 330. ISBN 978-0-85112-628-9. ^ a b c Erickson, Glenn (10 January 2003). "Stingray: The Complete Series". DVD Talk. El Segundo, California: Internet Brands. Archived from the original on 10 October 2017. Retrieved 23 February 2019. ^ Lewis and Stempel, p. 175. ^ Clark, Anthony. "Stingray: Original Television Soundtrack". sci-fi-online.com. Archived from the original on 27 October 2014. Retrieved 23 February 2019. ^ Cull, Nicholas J. (August 2006). "Was Captain Black Really Red? The TV Science Fiction of Gerry Anderson in its Cold War Context". Media History. Routledge. 12 (2): 193–207. doi:10.1080/13688800600808005. ISSN 1368-8804. OCLC 364457089. ^ Kurchak, Sarah (1 April 2016). "Puppet State: The Growing Cold War Anxiety of Gerry Anderson's Supermarionation Shows". The A.V. Club. Chicago, Illinois: The Onion. Archived from the original on 14 January 2018. Retrieved 29 April 2018. ^ Weiss, Josh (26 December 2018). "How James Wan Honored an Aquaman Easter Egg Request from Edgar Wright". syfy.com. New York City, New York: NBCUniversal Media. Archived from the original on 26 December 2018. Retrieved 27 February 2019. Originally published as: Archer, Simon; Nicholls, Stan (1996). Gerry Anderson: The Authorised Biography. London, UK: Legend Books. ISBN 978-0-09-922442-6. Bentley, Chris (2017). Hearn, Marcus, ed. Captain Scarlet and the Mysterons: The Vault. Cambridge, UK: Signum Books. ISBN 978-0-995519-12-1. Fryer, Ian (2016). The Worlds of Gerry and Sylvia Anderson: The Story Behind International Rescue. Fonthill Media. ISBN 978-1-78155-504-0. Hearn, Marcus (2015). Thunderbirds: The Vault. London, UK: Virgin Books. ISBN 978-0-753-55635-1. Lewis, Jon E.; Stempel, Penny (1996) . Cult TV: The Essential Critical Guide. London, UK: Pavilion Books. ISBN 9781857939262. Meddings, Derek (1993). 21st Century Visions. Surrey, UK: Paper Tiger Books. ISBN 978-1-85028-243-3. O'Brien, Daniel (2000). SF:UK: How British Science Fiction Changed the World. London, UK: Reynolds & Hearn. ISBN 978-1-903111-16-1. Rogers, Dave; Marriott, John; Drake, Chris; Bassett, Graeme (1993). Supermarionation Classics: Stingray, Thunderbirds and Captain Scarlet and the Mysterons. London, UK: Boxtree. ISBN 978-1-85283-900-0. Stingray volume originally published separately as: Rogers, Dave (1992). Stingray. London, UK: Boxtree. ISBN 978-1852831912. Sellers, Robert (2006). Cult TV: The Golden Age of ITC. London, UK: Plexus Publishing. ISBN 978-0-85965-388-6. This page was last edited on 7 April 2019, at 01:29 (UTC).